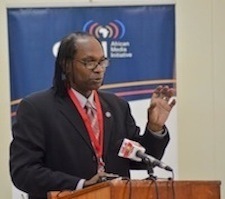 Meredith Beal, Chairman of Lasting Value Broadcasting Group, is a media owner in the United States and The Sr. Technology Advisor for the African Media Initiative (AMI). He leads a multi-country project to improve business management practices at media organizations in Africa, creating new revenue streams and developing sustainable business models that can be replicated at media organizations across the continent. Beal mentored dozens of African media organizations, helping them monetize mobile and online news services and also organized international mentors for newspapers across Africa. He is a former Knight International Journalism Fellow, a RIAS Berlin Fellow and a National Association of Broadcasters (USA) BLT Fellow. In 2006 Beal was appointed to the Board of Directors of the Texas Association of Broadcasters (TAB) to represent the interests of small market radio broadcasters. TAB is the largest state broadcasting association in the United States. In 2007 the TAB named him Texas Broadcaster of the Year. Before entering the broadcast arena, he was a Global Webmaster for Dell, at the time the world's largest computer systems company. His website received Dell's Intranet Award for Excellence and his team was known for pioneering in personalization and self-service web applications. While still at Dell, he purchased radio stations KTXJ-FM and KCOX in Jasper, TX, KCLW in Hamilton, TX and KOKE in Austin, TX. He left Dell in 2001 to focus on broadcasting and education, donating web design, video production and broadcasting programs to Huston-Tillotson University, lecturing at the University of Texas, University of Nairobi, United States International University and others. He has done numerous speaking engagements around the world promoting learning, innovation, wise use of technology, an attitude of global citizenship and dialogue as the best means to create a peaceful society. Beal has held positions ranging from radio and television talk show host, network implementation specialist and software engineer to Editor-and-Chief of major magazines and trade journals, music producer, reporter for media giants like the Los Angeles Times and record company executive. Before Dell, Beal was Director of Marketing for Motown Records. His experiences in the broadcasting and music industries, technology, journalism and the open data movement make him an excellent resource for learning how to take advantage of the new media landscape.